I thought I would update my old blog with a responsive layout considering the varying screen sizes people use today. I have imported this past blog entry with associated comments “Frogs in the Swimming Pool” to kick things off. Frogs and swimming pools have proven to be a problem for pool owners world wide with consistent search engine hits and many taking the time to comment on the blog or contact me personally. Visitor responses have varied from “How can I kill them?” to “How can I save them?” Being a frog fan my approach has always been to save them. keeping pool lights off at night and shading light from inside the house that could illuminate the pool area. I still have the occasional frog in my pool during breeding season but a quick check each day sees them returned to the pond and safety. The numbers dropped dramatically once the foliage around the pool was removed and I usually only find a couple each week. There are critter saving ramps available for pools on the market that allow frogs, lizards etc to climb out safely. I have not purchased any myself but have been told these work well. I image you would need more than one installed around the sides of a large pool. Good luck with your frog friends and remember they are there because your patch of land is a clean, healthy, balanced environment which is good for you too. I seem to forever be rescuing these little fellows from the side walls of the family swimming pool. 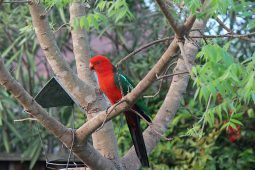 They call madly from the garden surrounds at night, particularly if rain is around. In the morning they can be found clinging to the sides of the pool with their top half pulled out of the water. The pebblecrete surface seems to give them enough of a hold on and they can stay pressed to the sides for many hours. We had a chunk of the pebblecrete break away from under the pool coping edge making a small cave just above the water level. This has become a frog favourite and one morning 6 little froglets were found squeezed in there hiding from the morning sun. It is amazing to see the variations in colours and patterns on the backs of these frogs. However they all have a black and white blotched belly. The photos below show some of the variations in colour and markings on the frogs I have rescued from the swimming pool. Hi Jane, how wonderful! We tend let our pool go a bit over winter as well. The filter still runs but we neglect the chlorine. I found a few tadpoles in early spring but in general the frogs seem to like to return to the frog pond (which is not very far from the pool) for breeding. Until this year, all my frogs have been ground dwellers. 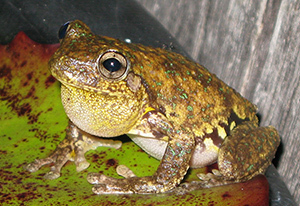 The Peron’s Tree Frogs you can see in another post are new residents. The problem with the ground dwelling frogs is that they can’t climb out of the pool. The sides are vertical and the coping edge overhangs just a bit. I have some flax plants along one side and the foliage regularly hangs in the water. Some times the little frogs climb on that or hide behind it but they still can’t climb out. I regularly check for frogs because if I don’t they will drown. The section of pebblecrete that broke away just above water level to form a little cave has been a frog life saver. It allows the frogs to crawl up out of the water to rest and provides a bit of protection from the sun. Before that I had few frog casualties. The other thing I always do is make sure the vacuum cleaner and plate is always in place in the filter so that when it comes on in the morning, the frogs do not get sucked in and drown. The Crinia frogs pictured in this post seem to be able to pull themselves up the sides enough and hang on all day but the larger striped marsh frog cannot. I saved one of these from “the cave” just yesterday. Will add some pictures of him soon. I’m guessing that your tadpoles must be tree frogs if they are able to climb out of a steep sided pool. With all this rain, your frogs are probably noisier than ever – mine are! We keep our cat inside at night too. If she manages to sneak outside she heads straight for the pond and the singing frogs. I wouldn’t be too concerned about your resident frogs. They must have places to hide (lots of foliage, nooks and crannies) and plenty of insects for food if they are staying around. Keep things mulched and well vegetated to attract insects for food and provide protection. As far as the pool goes the only problem I can think of is staining of the bottom surface from all the debris that falls in. Fallen leaves break down in the water and are your tadpoles food supply. If there is not enough vegetation, the tadpoles will not all thrive and grow to become metamorphs. If those leaves sit on the bottom for months and months you might get some staining. Tadpoles leave a lot of droppings as well. Perhaps you should ask a pool shop about dealing with stains in the future. You could add a frog pond to your garden so the frogs have somewhere else to breed when the pool is in use. I used an old kid’s plastic clam shell splash pool once. The frogs loved it. Just add rocks around the edge, few inside for them to climb out on and some pond plants. I often give my tadpoles lettuce (first frozen or boiled to break it down a bit) if there is not enough plant material and algae for them to eat. I have a couple of those cheap battery run solar lights that come on stakes pushed into the ground close to the pond to encourage insects at night. I’ve been feeding my tadpoles boiled lettuce as well as decomposed leaves and was not sure if that was the right thing to be doing. Thank you very much for affirming that it is acceptable. We are pretty sure that our tad’s are of a green tree frog variety as a green tree frog resided amongst the foliage of their habitat for some time. However, the tadpoles were getting picked off by butcher birds and the treefrog’s lovely call ceased to be heard from our bedroom window. Hopefully, it hopped off to a better location. My two and four year old boys love their little pets and in order to protect the remaining 15- 20 tadpoles we have put them in a large fishbowl. We assumed that they would start to develop legs quite quickly but now I’m under the impression that the tadpole stage is much longer than we originally thought. I’ll be looking out for a second hand kid’s clam shell or the like in the meantime 🙂 Thanks again! I love this article and great pictures! Swimming pools and frogs appear to be a problem for lots of people. If you have frogs in your area they are going to LOVE a large permanent water body in the middle of their backyard. When we construct our pools we all try to make them blend harmoniously with the environment. That usually means lots of landscaping – foliage, rock features etc. What an invitation that is for frogs to take up residence. If the pool was in the middle of a car park with no over hanging trees it might be safe. So what can you do? If there are frogs around – probably not a lot. Try to keep plants, leaf litter, logs, rocks etc well clear of the pool edge. I’ve heard that spraying the pool surrounds with very salty water can act as a deterrent but have not tried this myself. I guess the only way to keep them out would be to seal the pool completely with a pool cover. Sorry I can’t offer a better solution. I think your frogs are there to stay. Keep the chemicals up in the water. We usually add chlorine at night but it doesn’t keep them out. If the chlorine levels are very high as in shock treatment they seem to stay away. 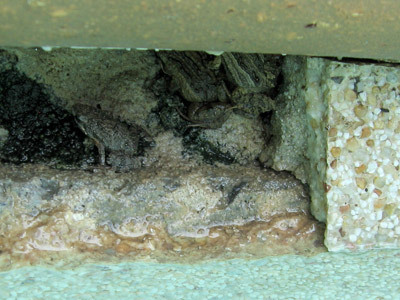 Hello While searching for Blogs about frog invitations I found your site Frogs in the Swimming Pool. Thank you for the effort you have put in. Hi Jim, Thank you. I love to share my frogs with other frog lovers. I only wish I had more time to add to the blog. I assume you’re in the Northern Hemisphere if Summer is your season. I don’t know what sort of frogs you have in your area but I would say the same sort of things would apply as down here in Australia. 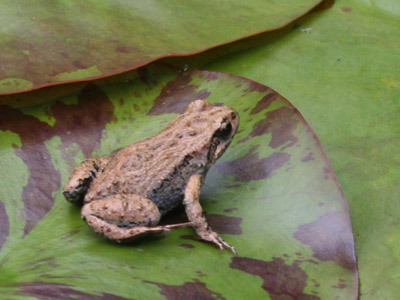 Studying the Life Cycle of a Frog is a wonderful thing to do with children. My kids loved it and were fascinated by the whole process. Last Summer, I took some of my backyard tadpoles to a local Primary School so the Year 2 teacher (a friend of mine) could study them with her class. Of course they were a big hit and the teacher commented that she believed it was an experience the children would never forget. Not many would have frogs visiting their busy city suburb gardens. So, I would definitely keep some of your tadpoles for your sons to enjoy. Some frog species have quite a long tadpole stage (6 months or more). Some take more than 1 season to develop. If eggs are laid and hatch late in the breeding season, the tadpoles may winter over and complete their development the following season. I have about 5 Peron’s tadpoles that have done this. We are now in early spring, I have some new little Crinia taddies in the pond but those Perons still have not sprouted legs. I would look at the number of tadpoles you have in your sons pool. If there are too many for the volume of water present then they might be suffering from overcrowding. 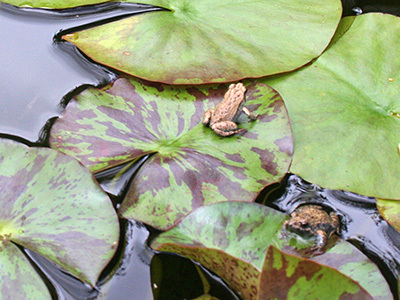 Overcrowding can have a significant effect on tadpole growth. I would probably keep no more than 20-30 tadpoles and make sure they have enough food – boiled or frozen lettuce works well. Releasing excess tadpoles in the creek should be OK so long as it is close by. It is not a good idea to move frogs to a new area as there is risk of upsetting the local population or introducing disease. This link has good tips on raising tadpoles. I hope that helps. Let me know how your tadpoles go. Hello everyone. I now have 2 green frogs living in my swimming pool here in Indianapolis, Indiana. We started with just one, Mr. Sticky, and now… 3-4 months later I’ve found another. I origonally worried about the effects the pool chemicals would have on Mr.Sticky, but he seems to be fine. The surroundings in our yard are quite bare, as the pool is only a year old. My questions is, should I bother with removing them for winter? We do plan on winterizing the pool, this means adding anti-freeze. Thanks for any advice. I’m sorry I don’t know the answer to your question. I’ve done some quick reading on American Green Frogs and discovered that they dive to the bottom of a pond or pool to hibernate over winter. Remarkable! I would have thought they would sensibly leave your pool, go off into the bush somewhere and find a rock, log or leaf litter to hide under. I guess they could happily hibernate in your pool but adding the anti-freeze may not agree with them at all. I assume it is a fairly non-toxic sort of product and not at all like the stuff we put into cars. But is it fish/frog friendly? Do people anti-freeze their fish ponds in Indianapolis? Hmmm, I think I would be removing the frogs before adding anti-freeze. It would be handy if you had a pond to relocate them to. Sorry, I can’t help but perhaps someone else can. I’ll pass on any comments/advice I receive. Best wishes to you, Mr Sticky and his friend. First of all congratulation for such a great site. I learned a lot reading article here today. I will make sure i visit this site once a day so i can learn more. My friend has a salt water pool and we called the pool people and they said that shocking the heck out of the pool and keeping a good eye on the water and shocking it weekly will kill the tadpoles and deter the older frogs from using the pool as a pond.. OH and i have caught many frogs at night when they are singing because they come up to the edge of the pool and you can just scoop them up. Oh and take a flash light cause they like to mate at the waters edge so just get your skimmer and get them out. Hi! I am in southeastern PA. I emptied the pool (just a 18′ X 4′ “pop up”). I went to put the cover on yesterday and found many. many tadpoles in the remaining water (along with a lot of algae). My first question is, how do i know if they are tadpoles or mosquito larve? I took some out and put them in a fish tank for my son, they look like they have big eyes. Second, what do I do with the rest that are in the pool? There is not much water left, therefore, it will freeze. Any suggestions? I recently suffered a salt-water pool disaster. A (friend) rippped the relief valve from the bottom of the deep end. To prevent rapid water loss, I grabbed a 10 KG pack of (colored) cement and trod it into the broken valve. Water retention has never been so good. Unfortunately it degenerated into a bright green opaque water that is fine to swim in. I’ve turned off the filration system, freeing myself (pensioner) of much cost. The salt remains at about 2.5 percent. and I’m adding no chlorine. How do I turn this redudant pool into a plant and frog paradise? Hi everyone, I found 1 treefrog in my pool. Silly me! I have a population of tree frogs in my pool and I am getting ready to open it for my kids. I obviously don’t want to hurt them….I love frogs. How the heck do I get them out of my pool before I add 5 gallons of chlorine? Please Help!!!! I have an inground pool (1980s) and I have an issue with multiple frogs swimming around and the next morning getting them from the filter; due to death. I was wondering if there is a product out there that I can place near or over my filter? We took those white steps out because they were very old. THANK YOU for your assistance. Sorry I don’t know if there is a filter stopper for frogs. I tried various nettings over the intake area but the the filter just wouldn’t work properly. The frogs would most likely drown unless they could climb out. I guess I would have to net the whole pool. Maybe one of those pet saver things either side of the filter would work – help them climb out. No use of course if the frogs die in the pool water first. If you discover a solution, please let us know. I recently found a frog living in our pool (for a week now). I don’t care that he is there, the chemicals doen’t seem to bother him; nor does our swimming in the pool. I am just concerned whether he can actually get out of the pool if he needs or chooes to. I haven’t seem he jump out yet. I have taken him out twice, only to find him back in the pool lounging on the steps. Do I need to help him out occassionally? And what about the skimmer (the thing withthe cover and the basket)? I would think this could be a danger. Per your many other repsonses, adding a pond would be beneficial, but not really possible for us. You have a stubborn frog! Some of my pool visitors were much the same – the little Crinia in my posts. I’m sure that the same ones returned to the pool every time I removed them! Check his feet next time you take him out. Look for toe pads which would indicate he is a tree frog and so able to climb out of the pool when he wishes. The skimmer box is a big danger. Our filtration system runs twice a day. In the evening it switches on at dusk, in the morning after sunrise. This is the problem time as the frogs often hide in the opening from the sun. Your guy sounds like he is happy to stay out ( I hope the birds don’t find him). As for the chemicals in the water… many frogs seem to cope with the normal levels quite happily(after all you swim in it!) but prolonged exposure may be a problem especially if you give the pool shock treatment doses. Good luck with your frog. I hope he stays safe. @ will…there is a product online called the critter skimmer…i am not sure if it works but it looks pretty legit, maybe worth taking a look at it! We have had a resident bullfrog in our inground pool all summer.I have relocated him to a nearby pond repeatedly only to have him return. We have delayed closing our pool but now must as a safety issue. What do I do? Should I deposit a tub of leaves to the bottom of the pool and do I need to get an ice melter so he receives oxygen? We are building a pond but don’t anticipate it being ready soon enough.Please advise. We are are based in Australia so I’m not familiar with your bullfrog friend. My first thought is that the frog must have spent last winter somewhere (assuming he is more than a year old) or began life in a pond that was not your pool. I’d be inclined to remove him from the pool, perhaps keep him captive until the pool is closed, then relocate him to the nearby pond. Perhaps someone reading the blog can help on this one. We always have frogs in our pool, just the odd one, and I’ve identified them as the giant banjo and the spotted marsh. The giant banjo species often lives in our garden (burrows into the dirt) but other than that I’m not sure where they come from. 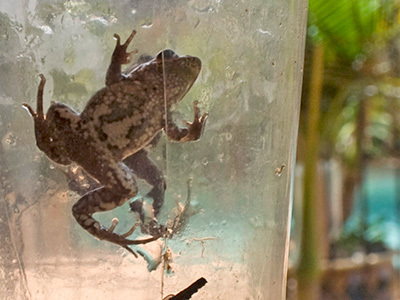 Sometimes the frogs die – is this from the chemicals in the pool or just drowning? Whenever I rescue the frogs I rinse them in very shallow freshwater and monitor before releasing them in our front yard (although there’s no water source there’s dogs in my backyard). There’s a long narrow drain system with grass and plants about 100m or less from my house – would it be safe to relocate them there? One of three frogs I rescued today died – It was very limp to start with but when I put it in the freshwater it sort of spasmed and then died.. Did I do something wrong? I think you are doing the right thing. I do the same… rinse them off with fresh water. If they are in the water too long there is not much you can do. A combination of the chemicals and being water logged finishes them off. The drain system may be Ok so long as the water there is not polluted. I think the front yard is fine. If there is vegetation for coverage and a food source they should be happy. Some of my frogs around the yard are quite a distance from the pond. They settle where there is a good source of food and probably some damp nooks and crannies for protection. I guess they come back to the pond just to breed. We now have some 20+ frogs that have been retrieved from our Melbourne suburban pool. 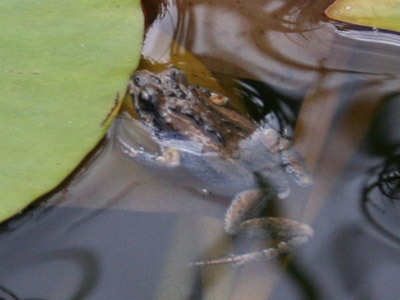 Most appear to be spotted marsh frogs bu a couple look different – have a reddish stripe, or have stripes rather than spots We are keeping them in a small plastic pond at the moment with a net cover over them. Buying baby crickets to feed them is getting expensive at $8.00 per tub from the local pet shop! 2. Should I drop them off at the local creek? Well, the frogs love your backyard and pool! $8 a tub for crickets sounds expensive to me. I hope you are getting a lot of crickets at that price. Have a look at http://frogs.org.au/arcade for a comparison. A shovel full of compost or leaf litter is an excellent source of bugs if you have some which is chemical free. As for dissuading the frogs from your pool… the only thing that has worked for me is removal of vegetation around the pool edge. We recently removed some overgrown plants that continued to droop towards the water. I’ve had hardly any frogs in the pool since then. If they are ground frogs a barrier would work if it were high enough. If your local creek is no more than a couple of blocks away I guess you could relocate them. The practice is frowned upon as there can be significant variations in frog populations and introducing new frogs into an area can upset the locals as well as possibly introducing disease. Frogs in the pool seems to be a common problem worldwide. I wish you luck with yours. i have a frog in my pool what do i do? i live in sandy oregen. I am a realtor that has a REO listing in Hemet, CA. I was informed the swimming pool is full of Tadpoles and frogs..small and large. I am also a Frog lover so I wan’t no harm to come to these creatures. I am based out of Utah and need to find a contractor or a company that knows what to do in this situation in CA. If anyone knows of a solution or a Company I can call to help me relocate these Tadpoles and Frogs please let me know. This needs to be taken care of this weeks as the Property just went under contract. Thank you in advance for any info. We haves saltwater pool and frogs are constantly inhabiting it. I’m going to be blunt though, My siblings and I can’t stand the bloody creatures. Every time one brushes against us in the pool we get freaked out. But when we scoop them out, they immediately jump back in. I think they are attracted to the dark colour of the bottom pool. How do We keep them out?!?!?!?!?! As much as I love my frogs I don’t want to swim with them either! It sounds like you’re stuck with them. I just want to know if it is unhealthy for humans to have a lot of frogs around the outside of the house? If you have frogs at your place I would say it is a good thing. It means the environment must be a healthy one free from chemicals/pesticides and I guess what is good for them is good for you. There must be a good food source so they will be keeping the insect population down – also a plus for you. Frogs secret chemicals from their skin and some can be toxic. So long as you don’t go around kissing frogs looking for a Prince you should be fine. :P.
If handling any frogs always wash hands immediately afterwards or wear gloves. Frogs are often associated with good luck too! We live in Michigan, and have an inground pool. Many mornings, we awake to find several small, baby frogs swimming in our pool. We just scoop them out with the net and put them in our bushes in hopes they will feed off of the insects. We have a cement patio surrounding our pool and have learned to watch where we are walking in the night time, because that seems to be when they come out. Never hear them making any frog sounds, but as the summer goes on and we see they are growing, we know they must be doing their job of keeping the insect population down! The last 2 nights, we have had heavy rains and yesterday morning there were over a dozen baby’s swimming around, and this morning there had to be about 30 of them in there! I’m just curious as to where they lay their eggs, it must be on land because we have never found any eggs in the pool. We also wonder if it is just natural instinct for them to jump into the water, or in the case of the heavy rain they got washed in there? We consider these guys to be friends and find them very beneficial to our garden. Was a little concerned in the first months of summer because we only found a couple of them in our pool, but after these last few rainy days have found more than ever before! I guess they must like it around here! Much the same thing happens at our place though I don’t have so many frogs that I need worry about standing on them at night. I think the natural instinct to jump into water when the rains come is overwhelming. There is a lot of activity here in late Winter/Early Spring especially when the rains come. There is such a cacophony in the backyard we need to turn up the TV volume! I’m surprised you hear no frog sounds. I find the calls vary so much and often sound nothing like your traditional frog. It may well be that they are calling and you do not recognise the sound. I do not know anything about frogs outside of Australia but it is possible that your frogs lay on land or puddles in the garden. Given they end up in the pool I guess that is a more likely breeding ground. Eggs can be hard to find unless the species lays them in a foamy raft on the surface of the water. I think you need to find some info on frogs in your state and local area. Take some pictures of your little guys, all sides and belly if you can, and try to match them with photos of frogs in your area. Putting one into a clear container may help. Also become familiar with the calls of different frog species and you may discover that what you thought were crickets or other insects, owls? etc, may well be your frogs. 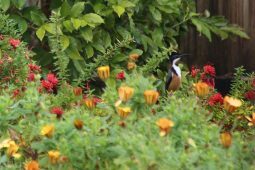 I agree they are very beneficial for the garden and it is comforting to know that they thrive there in what must be a healthy environment. I welcome the occasional visit a blue tongue lizard makes to our place too. The snail population drops significantly! Best wishes to you and your frogs. PS: Does this site help? We have been away since winter for a month and our pool is going to be painted soon. We emptied the water before the holidays and now the rain water has gone in! Two days ago we came back and found 4 frogs in our pool last night! I would like to know what to with them!? By the way, have you fixed your frog problem yet? We are in Sydney and we have just started a frog PROBLEM! Thank for dropping by. I love your Blog. Keep up the great work. No way, not a problem. I love having the frogs in the yard. We recently cleared the plants around the pool that were hanging towards the water or dangerously close and that has made a big difference. 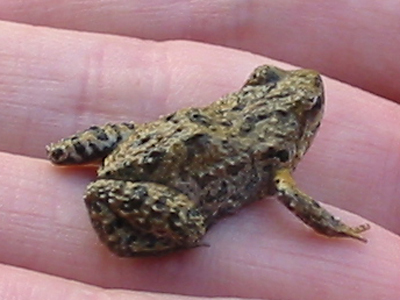 I have only found 1 little Eastern Froglet in the pool this season and that was after the recent batch of rain. The backyard is alive at night with their calls especially after rain and usually when it is not too hot. The Eastern froglet seems to prefer cooler weather. They will drown out the TV with their chorus! I have 3 water gardens in pots around the paved area near the pool. In them I have put pots of water plants, rushes, waterlilies etc. They are teaming with Peron’s Tree Frog tadpoles. 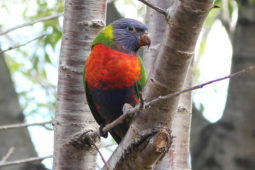 The Perons seem to prefer these to the pond down in the garden. I just hope the water does not get too warm for them. Good luck with your frogs. I’m sure they will stay away while the pool is being painted. Perhaps you can give them an alternate place to swim. For now, I would just put them in the garden… somewhere where there is plenty of mulch and plant cover. hey i am raising little frogs from the beginning and i got the eggs from my pool. they are still eggs because i just got them out while i was swimming a little. i dont know if the pool water with all the chemicals is safe for the tadpoles when they get to that stage in life is gonna hurt them or what. the other two frogs in my pool seem like they are doing fine. My experience has been that pool chemicals are deadly to eggs and tadpoles but frogs can tolerate them if not too concentrated. I am successful. But they are very elusive. Anyone have a better way to kill these pests? I am sorry you feel that way. Unfortunately frogs can be troublesome and are not loved by some people such as yourself. Just remember that the frogs in your area indicate a sound, balanced environment. Something that is important for your health and wellbeing. We hsve alot of frogs in our pool and they also sit on the solar cover. We had 16 just on the solar cover. We really need help getting rid of them. This happens every day. You don’t say how high the pool is but I would say if the frogs managed to get in there, they will probably be able to get out. You can always put something in the pool overnight (wood, stick, cloth draped over the side). Even if they are tree frogs they may need help if the sides are particularly slippery. Hi, I’ve been unscuccessful searching for information to see if there are any pool or environmental laws to help us. Our neighbour has a pool and in the ten years we’ve lived here, they’ve used it exactly twice – it’s completely igonored and is usually green or black. Once a years they’d get in a pool service who’d spend an entire day trying to get it clean. With the recent laws (QLD, Aust) they put a large shade cloth covering over the pool, and again ignored it, the usual swamp colour and leaves have now covered the surface and believe it or not – grass is growing a few metres from the pools edges over the covering. This has brought in the most annoying sound in the universe… MARSH FROGS! I’d be happy for them to be eradicated off the face of the earth. We have to close the house up completely, turn the air conditioning on and I’m now also using ear plugs to try and sleep. They are so loud it’s like hail on a tin roof. Please, please help, what can we do… can we report them for pool neglect that is harvesting these little monsters? What a sad situation. If I were you I would be seeking advice from my local council. 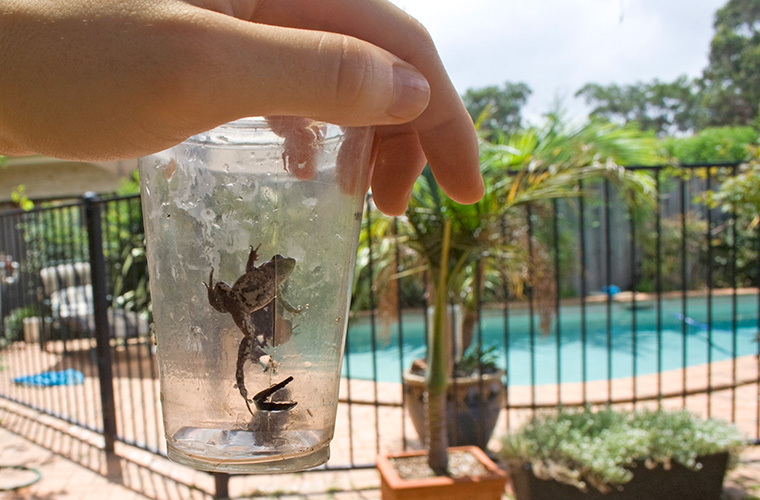 Regarding frogs unable to get out of your pool: I recommend creating either or both, two kinds of aids. 1) a small floating platform ( 1 x 4 plank, maybe 6 to 12″‘s long) and float it at a pool edge, tied to the pool ladder arm, perhaps (this gives them a platform to jump from out of the pool). 2) a board of about the same side tied to something above the pool (a chair leg for example) with enough tension so that it can be hung top against the pool edge-top and lower end floating in the water. The board needs to be rough enough for them to clamber. They can neither climb nor get a footing enough to hop if the surface is a slick lumber one (worse yet plastic, etc.). NOTES: I confess I don’t understand why so many frogs end up in my pool rather than stay around the little natural lake where presumably they hatched, many hundreds of feet away from my pool and through tall grass. Last year the numbers were so great I would collect them for days then drive them the distance to that little lake. It DID serve to cut down the number that ended up in my pool. If ever again as bad as last year, I may take a neighbors suggestion to put a high (2 foot) plastic ‘wall’ in the shrubbery around the pool to block their access. I would be interested to know if anyone understands why they would head for my pool versus staying in or heading to the beautiful water lillies and duckweed adorned lake with it’s west side overhung with towering trees. Thanks for your comments and excellent suggestions. Easy, cheap and I’m sure quite effective. I guess we would have to ask the experts why the frogs prefer your neck of the woods. I have read that frogs are known to travel widely when looking for food and no doubt will settle somewhere where food is plentiful, there are places to hide and water for breeding. I’m glad this is the case as otherwise I would have no frogs visiting my backyard. I have also read that some frogs are territorial and competition for a prime calling spot can result in some species of frogs being driven away. There may be other reasons – aspect, water temperature, water movement, pollution. We are in the middle of winter here but have had some very mild sunny days and a bit of rain. My little Eastern Froglets are going berserk, calling night and day. We found one of the little fellows in the pool yesterday. I’m beginning to think he ended up there because of the high numbers calling from around the pond! My little Eastern Froglets behave like that. They love the mild Spring weather but after a few weeks and particularly once the temperature goes up a bit, they cease all calling and seem to disappear altogether! I live in Portland, Oregon USA. My neighbor’s above ground swimming pool turned into the most fantastic Pacific Tree Frog (sometimes called Pacific Chorus Frog) breeding ground. Sadly….the house was sold and completely demolished this summer. We have been finding the little sweeties in our yard. I want to recreate a water source for them and we are considering just buying a rectangular above ground pool (we need rectangular to accommodate space issues) and letting good old Portland rain and mother nature run their courses so to speak. I am wondering if the new plastic of the pool would “off gas” and be unappealing to the frogs? From reading all the posts above, clearly frogs are happy to lay eggs in some unlikely places but I was wondering if you had any suggestions for what to or not to do. We have raccoons, possums and feral cats in the neighborhood so we feel “above ground” is best. This is an awesome blog by the way! Thanks! Sounds like those frogs were very happy in the neighbour’s pool. It is wonderful you are considering setting up a pool in you own yard to replace their lost home. Plastic should be fine but I always wash any new plastic boxes I use with hot, mild soapy water – the mildest hand dish washing detergent I can find. Then rinse very, very, very well. Plastic/vinyl from a new pool probably settles down quickly. I guess you could fill the pool, let the water sit for a few days, then drain and refill… Maybe add some water plants to make the pool more inviting and let good old nature get to work. 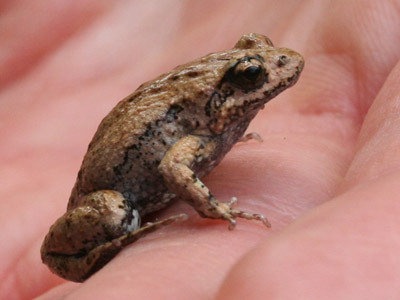 I must look up the Pacific Chorus Frog as I’d love to know what his call is like. Also curious… would raccoons try to eat tadpoles? Thank you! Happy Spring. Its Fall here now (obviously) but I am still hearing some “croaking” from some individual frogs. The “chorus” in the spring time here is magnificent! The Oregon Department of Fish and Wildlife recommends fencing an intended tadpole habitat to keep out predators. Some other Portland friends have told me that they have tried to have ponds in their yards but “the raccoons ate the tadpoles”. I have not researched that in particular though. We go into our daughters pool many times in summer. there was a little frog in pool. our concern turned to a little friendship with Freaky ( we named it) he is almost playing hide and seek with us every we go into pool. im checking with daughter to see what they put in water when they close. at first she was a little disconcerted with Frisky, but now she calls us in Florida to keep us posted. The kids love it ! Are WE the freaky ones? Your son can only keep the frog if your state laws allow it. Here in Australia, NSW, you are not allowed to keep frogs as pets unless you have a keeper’s license and then, never a wild frog, only frogs purchased from licensed frog breeders. Frogs eat live food. I usually buy crickets from my local pet store. Frogs are messy creatures and often the crickets drown in the water so it is important to keep your frog’s home very clean. I think my eggs in my in ground pool are crickets.. Does anyone else have this problem? And a critter skimmer pool skimmer. I have never seen a frog come out of the critter skimmer but I go out every morning and pull it out and often there are frogs on the ramp so at least they don’t drown.mFor the frog haters ask yourselves if you prefer swimming with dead bodies in your water or going to the “trouble” of saving their lives. It wAsn’t sure the frog lob was helping but I took it out overnight and the next morning there was a dead frog and one swimming around where the frog log had been so I’m sure it does work. I always find these little guys clinging to the side of the wall and remove them from the pool deck so they don’t drown in the pool, but are they safe outside? There are no natural bodies of water out there; should i bring them to the bird bath out back? I remove them so they can live, I hope it’s not catalyzing their demise! It won’t stop visits to the pool but an accessible pond/container of water may help with their choice of breeding spot. I remove them from the pool too and relocate them to the pond area but I’m convinced the same frogs keep returning! Hi. I found two dead frogs in my skimmer yesterday. 🙁 I haven’t heard frogs in the pool but can’t seem to get the water clarity right to be able to see the bottom 100%. So I don’t know if there are more. I don’t want dead frogs but I don’t want them in my pool either… We have an above ground para pool with a deck around it. So they may have got in off the deck. If there were more in there, would they be on the top of the water or can they live on the bottom until the chlorine eventually kills them (whoch I have read happens)? The kids have been swimming and I don’t want kids or frogs to freak each other out! I have two bull frogs that jump in the pool (6ft deep) frequently at night but the next morning they’re gone. People say frogs can’t jump out the pool they just drown well I can tell you for sure they jump out. Does anyone know how they do this, there’s no ladder in the pool.